When Russ and I moved to Duluth in 1981, I didn’t know anyone in the birding community here. I was pregnant with our first baby and had just left a teaching job and students that I loved. I’d been an active member of Madison Audubon, providing regular beginning birding classes for Madison Audubon for a few years, and I wrote regular features about birds and birding for the morning newspaper, The Wisconsin State Journal. But neither of those niches was available in Duluth. The newspaper wasn’t at all interested in me, and the idea of providing free bird walks for beginners and the general public was rejected out of hand by Duluth Audubon, because someone else was providing birding field trips for a small fee and no one wanted me to compete with him. I’d pretty much set my life goal as being an advocate for the love, understanding, and protection of birds, but suddenly didn’t know how to do that anymore. I quickly became editor of Duluth Audubon’s newsletter and then president of Duluth Audubon—two jobs no one else wanted—even though both required a level of administrative skills I am utterly lacking in. The Duluth birding community was fairly insular, and my shyness didn’t make it any easier for me to break in. And no matter what I did, I felt like I was stepping on someone’s toes. When I started producing “For the Birds” in 1986, some of the local birders were very resentful, even as the program brought in more interest and membership at Hawk Ridge and greater participation in the local birding classes. I felt as much an outsider as ever. But one woman in the birding community was outgoing and extremely friendly from the very start. Not only did Koni Sundquist help me adjust and make me feel valued—she cheered me on as I developed my own niche so I wouldn’t be competing with anyone else. Koni was a bird bander and had become the one person in town who knew how to rehab birds. She never had state or federal licenses for that, yet it was people in the DNR and the US Fish and Wildlife Service who most often referred people with injured birds to her. When I started doing my radio show, people started thinking of my name when confronted with a hurt or orphaned bird, and suddenly I was coming home from the pediatrician or wherever I’d been to find a box with a bird on the front porch and a message like, “Take care of this bird. God bless you.” Koni took them at first, but not only encouraged me to learn how to take care of them myself—she also talked me through the challenges. She had endless compassion for birds (well, except for her neighborhood crows), and was the most generous person I’ve ever known in her willingness to share every bit of her own knowledge, never seeing anyone else as a competitor but as a teammate. I called Koni a lot, not only for advice about hurt birds but also just to talk. I’ve never known anyone so relentlessly cheerful and upbeat, even as she faced widowhood, losing her son, and serious health setbacks of her own, including the loss of much of her eyesight. Her laugh was infectious and unfailingly filled with a chickadee’s joie de vivre. When I took my job at the Cornell Lab of Ornithology, Koni sent me several letters. Opening them was just like talking to her in person, her handwriting as large and ebullient as her laugh. She was like a one-person cheering squad. I almost certainly would not have found my own path without Koni’s encouragement and help. She was the kind of generous human being who rolls up her sleeves and does what needs to be done, never for any kind of reward except knowing she was doing what was right. I simply and absolutely would never have become a licensed bird rehabber without her encouragement and help. Reading that was solid evidence that Koni was herself, and all was right with the world. I thought to myself how I need to call her up, but I had a hectic spring, out of town a lot. It could wait until things settled down in June. On May 30, I left for Maine, for a speaking engagement at the Acadia Birding Festival and to teach a birding class at National Audubon's Hog Island. On May 31, Koni died, at home just as she would have wanted. My flight home didn’t leave Maine until afternoon on June 9, the day of her memorial, so I missed even that. To the very end, Koni was a far greater friend to me than I was to her. How I will miss her, and the reassuring feeling that while Koni was here, this planet was a bright and jolly place. I’m filled with sorrow that I never gave her anything close to the riches she gave me. 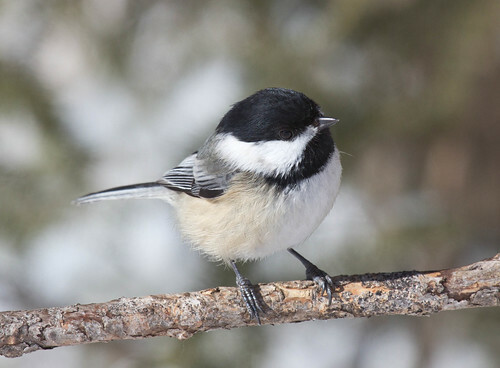 If you could do a family tree and individual life history for every chickadee in Duluth, I bet most of them have, somewhere in their ancestry, a bird that was saved by Koni or by someone like me who was only able to help it thanks to Koni. I love thinking about that, because like her beloved chickadees, Koni loved and accepted everyone who wasn’t out to harm little birds, and like chickadees, Koni withstood the worst that life could throw at her without becoming jaded or sour. When I hear my neighborhood chickadees warning about a hawk or cat, I’ll think of Koni Sundquist, yelling at crows and swatting at bears even as she was ever cheerful and laughing—a chickadee to the very end. Oh, Laura! What a lovely remembrance. Laura- what a lovely tribute!